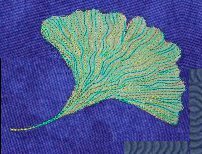 My ginkgo piece is the fifth in a series based on the shape of a very oversized leaf. 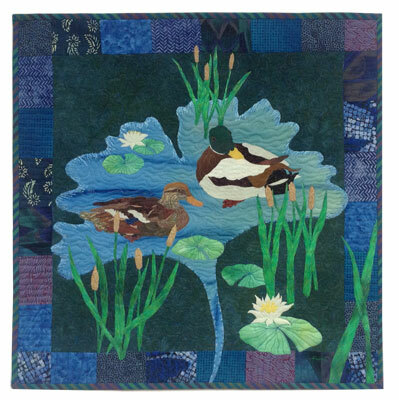 This one features 2 mallard ducks swimming on a pond which is the leaf. I had a good time dreaming up this piece, but quite a struggle actually designing it. It became more complex than I had envisioned it in my mind’s eye. The two ducks, Ethel and Norman, needed something more to surround them in the water. 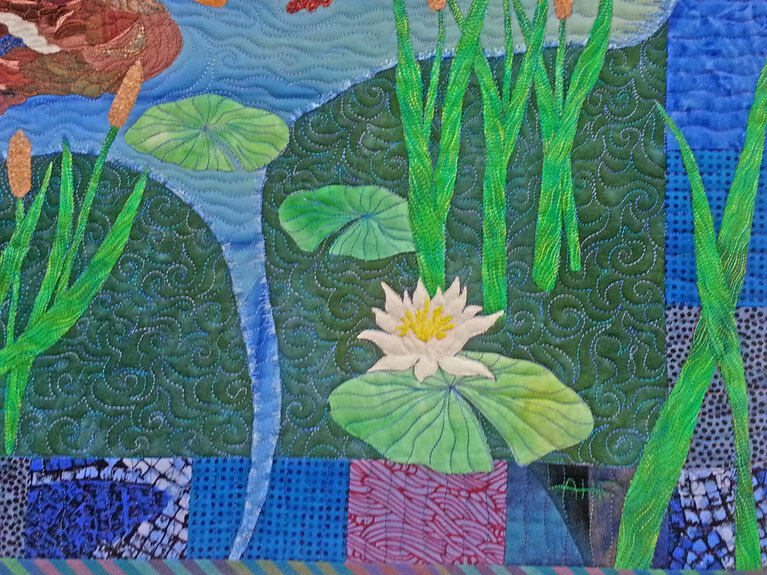 So, I added water lilies and cat tails which was just what the composition needed. The last item was some greenery in the lower right corner, and it was complete. I combined all my favorite techniques in this little piece. The blue ginkgo is fused and the edges finished with my Florentine edge appliqué; the cat tales are embroidered in place; everything else was left raw edge until the piece was quilted. Most of the thread work is done with variegated threads. The fabrics used are a mix of hand dyes and commercial fabrics. Wool batting. The edges are bound with a green/rose/blue stripe that works perfectly to complete the piece. Sorry, I just couldn’t fit in Walter, the elusive fish.